Promoting your blog posts is a grind. There are no silver bullets, quick fixes, magic “traffic” tricks that are going to help you get the thousands of visitors you’re looking for. However, there are certain hacks that can help you get a head start. And the best part about it, is they’re all free! Let’s say every employee in your business turns their email signature into a call to action to your blog post. How many people will see it? Let’s say you have 10 employees. And each employee sends out 10 emails per day, five days per week. That means 500 people per week would see your compelling call-to-action. Multiply that by four weeks per month and you’ll automatically expose your lead gen offer to 2,000 people per month. For years, my boring email signature was a wasted opportunity. Here’s the simple step-by-step process to turn your email signature into an opportunity to get your blog post more views. This step is optional. But creating a Bitly link can give you additional data and insights that you might not otherwise get. However, I like to create a link just to keep track of the clicks that I get. It helps me tweak my offers over time and get a general feel for what’s working. 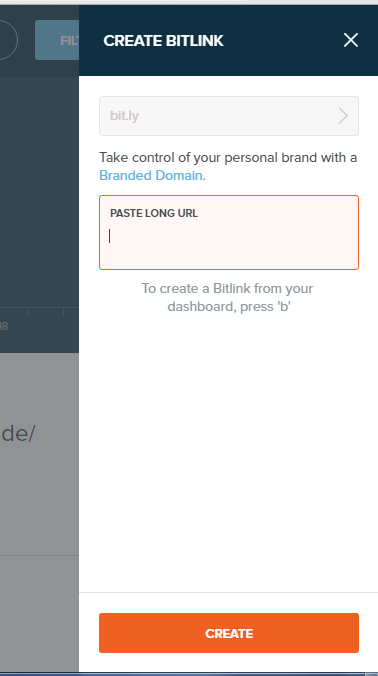 Then you’ll be able to copy your new Bitly link. 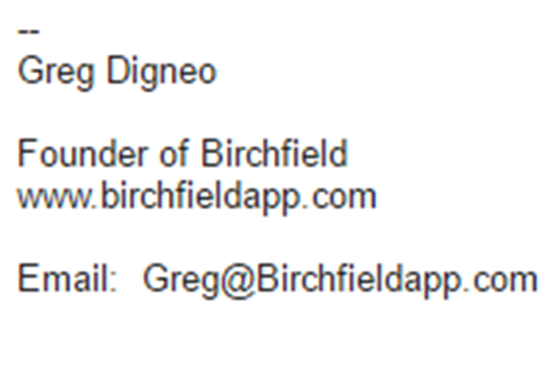 These days, all email services allow you to create a customized signature. Since I use Gmail, I’d find the “Signature” section under the general settings tab. Here, I’d paste my Bitly link. Next, you have to give people a reason to click on your post by creating a compelling call-to-action. To do this, you can simply write “click here” before the headline of your blog post. 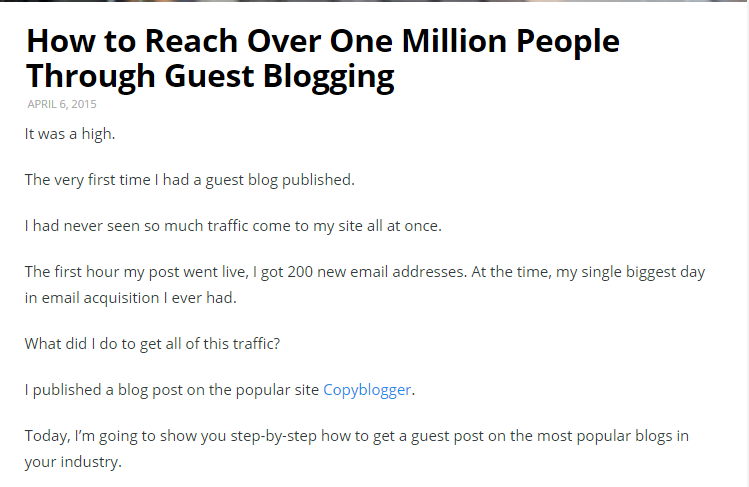 For me, my call to action is “Click here for complete guide on How to Reach 1 Million People through Guest Blogging”. Finally, make it stupid simple for people to click your link. To do this, I hyperlink my entire call-to-action. That way, no matter where the person clicks, they’ll wind up on my blog post. And that’s it. The whole process takes just a few minutes, is entirely free, and is a dead simple way to get more traffic to each blog post you publish. We all know social media shares drive traffic to your blog post. However, even if your content is really good, less than half the people who visit your post will share it with their friends on social media. But what if you give your readers an incentive to share your post? In other words, when they share it with their friends, you give them something in return. This is known as an incentivized click trigger. On a post where I show people how to get a guest post accepted on a popular blog, I figured a complimentary resource could be called “101 blogs accepting guest posts”. After all, once you know how to get your post accepted, it might make sense to know where to pitch your post. Next, you’re going to create a simple call to action. Remember, my complimentary resource is called “101 Blogs Accepting Guest Posts.” So I simply tell my readers how they can get access to it. Once the person clicks either the Twitter or Facebook button, they’ll be asked to share the message that you created for them. 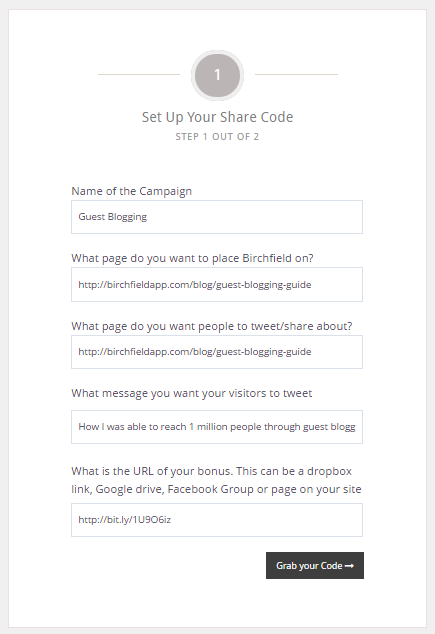 This makes it as easy as possible for your readers to share your post with their friends and followers. And finally, the reader will be able to download your complimentary resource. I learned this hack from Noah Kagan of OKdork and SumoMe fame. You see, whenever you send out an email broadcast to your list, most of the people who receive it will never open it. In fact, my broadcast emails receive at best a 35% open rate. (Most of them are even less than that.) Meaning that 65% of the emails that I send will never even be opened. Noah had this same observation and decided to do something about it. He sent out an email to his list, and Noah has a really big list, about how to 10x email conversion rates. 71% of the people he emailed did not open his email. Not too shabby for just an additional minute’s worth of work. One of my absolute favorite ways to get more people to read your blog post is to syndicate the content to a much larger audience than your own. By syndicating your content, you’re giving larger publications permission to publish your content on their website. 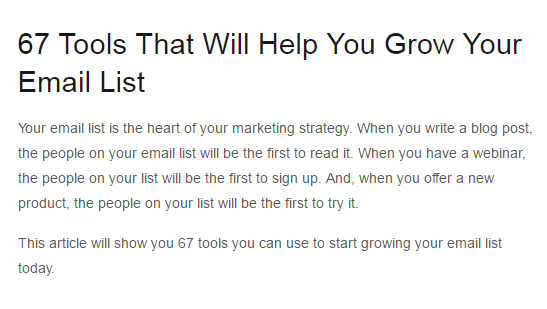 I wrote a guest post on the blog Kissmetrics called 67 Email Tools that will Help You Grow Your List. And it did quite well. Not only did the post get a lot of shares on social media, it also drove a lot of traffic to my site. So, Entrepreneur.com decided to syndicate the post. Not only did It drive traffic to the original post, thus increasing traffic to my site, but it also gave me a ton of street cred when I was just starting out. And James Clear used content syndication to go from about 1,000 visitors per month to 250,000 uniques per month in about two years. So, let’s talk about how to get your content syndicated on a popular blog or publication. This goes without saying, but the largest and most respected publications want to publish only the best content. Their readers expect it. Their brand depends upon it. Business2Community: A popular multi-author business blog. Social Media Today: A popular multi-author social media blog similar to Social Media Examiner. Business Insider: A popular business publication. Having a relationship with an editor will help your chances greatly. AllBusiness: A popular multi-author small business website. Huffington Post: One of the largest blogging platforms in the world. If none of these work for you, or if you want more of a variety, you can always use Google to find additional syndication platforms. You can use the search query: “This blog was originally published on.” This is because Google requires all syndicated posts to contain this message (or something similar). Second, you can use the search query: “Sites accepting syndicated content.” Other bloggers have curated lists for you that will help you broaden your reach. I wrote the following post which details a step-by-step guide to getting a guest post accepted on a popular blog. I leave absolutely no stone unturned and I think that SteamFeed.com readers will love it. If you enjoy it, I’d love to see it republished on your blog. Some publications may want you to make some tweaks to your post so it’s not exactly the same as the post published on your blog. Usually, I tweak the conclusion of the post in order to make some sort of call to action. 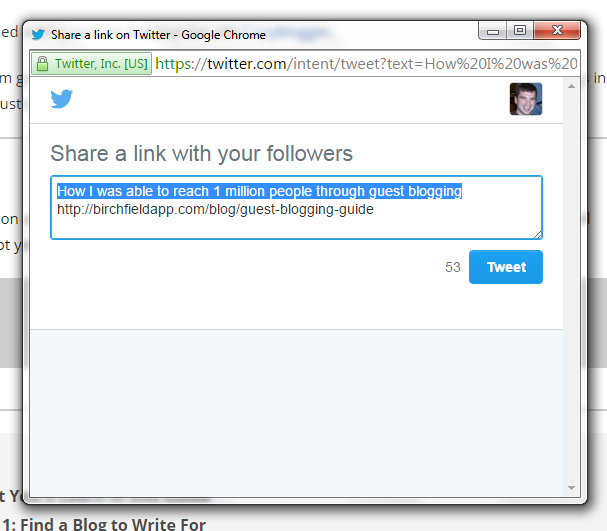 And I tweak the introduction of the post to make it align more with the readers of the blog. However, this takes a grand total of 20 minutes of additional work. So even if you’re pressed for time, it’s pretty easy. As a business owner and marketer, I know how much work it is to get traffic to your blog post. There are no silver bullets or secrets to great marketing. You just have to embrace the grind. However, with these four hacks, I hope that even with your busy schedule, you’ll be able to find the time to promote your killer blog posts so that they get the attention they deserve. This article originally appeared in The Mention Blog. This article was written by Greg Digneo from Business2Community and was legally licensed through the NewsCred publisher network. Next article10 Point Checklist: Is Your E-Commerce Business Ready for Cyber Monday?